Mary Jane (Benson) Davis, 70, of rural Rockville, Indiana, went to be with the Lord on November 2, 2018. Born November 18, 1947 in Bunson, Indiana, she was the daughter of Charles and Rachel (Wheeler) Benson. Mary was retired from DADC in Terre Haute and during her time there created several great relationships that she cherished deeply and continued even after retirement. 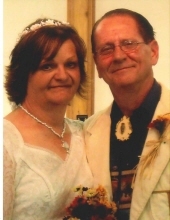 Mary found renewed life in a late life courtship that lead to Partner and Best Friend Charles Davis which she married October 25, 2010. Mary also cherished her time spent with all her grandchildren, great grandchildren, and longtime friend Maxine Spendal and the adventures they pursued over the years. Mary was an active member of Berean Baptist Church in Terre Haute and truly enjoyed her fellowship and church activities throughout the years of serving the Lord. Mary is survived by her husband Charles Davis. She was one of 7 children, surviving include Nancy (Bill) Prouse, Sandy Russell, Richard (Fran) Benson, Becky Hall, Betsy Rabold. She was blessed with two children Roy (Diane) McConnaughey , Starla (Dan) Jones. Also surviving are several grandchildren Adam (Shelby) McConnaughey, Tara Bennett, Lindsey McConnaughey, Lyle Wimmer and several great grandchildren. She is preceded in death by her parents; brother, Chuck Benson; brother-in-law, Jerry Russell; and sister-in-law, Elaine Benson. Funeral services will be Tuesday, November 6, 2018 at 1:00 p.m. at Barnes and Rice Funeral Home, 111 East High Street, Rockville, Indiana, with Pastor Larry Lilly officiating. Visitation will be Tuesday, November 6, 2018, 11:00 a.m. until time of the service. Burial will be in Beacon Hill Cemetery, U.S. 41 South of Rockville. Memorial Contributions may be made to Berean Baptist Church, 6770 N Clinton Street, Terre Haute, IN 47805. To send flowers or a remembrance gift to the family of Mary Jane Davis, please visit our Tribute Store. "Email Address" would like to share the life celebration of Mary Jane Davis. Click on the "link" to go to share a favorite memory or leave a condolence message for the family.